“The course offers two sprint possibilities. We’ll go for the victory with André Greipel or with Jens Debusschere in those stages. The other three days will determine the GC, which is not a main goal." From Wednesday to Sunday, the Volta ao Algarve will take place. It’s the 42nd edition of this Portuguese stage race which is part of the Europe Tour. This race brings the riders in five stages through the beautiful but tough landscape of the Algarve. Lotto Soudal will be there with a classics team. Riders like Tony Gallopin, Jürgen Roelandts and André Greipel will participate. New member of the team Jelle Wallays and sports director Herman Frison give a little preview. “I rode my first race kilometres of this season in the Etoile de Bessèges and I’m very happy about that race," Wallays says. "Mainly, it was the case to maintain the good position of Tony Gallopin in the GC and that worked out well. It was the first time that I raced in the Lotto Soudal jersey. It certainly is a step forward and I feel really good in this team. The atmosphere is just great. “We have already been a few days in Algarve with several riders of the selection because Jürgen Roelandts owns an apartment in this region, that’s very handy of course. Personally, I think we’re going with a very strong team to the Volta ao Algarve. My role will be riding in function of the team. Preparing the sprint for André Greipel or keeping the GC riders in the front of the peloton. Perhaps I can test my own condition when it’s possible, we’ll see. “First of all, this stage race is a preparation on the spring classics, but we won’t ride in the back of the peloton," Frison said. "We want to perform as well as we can and go for the victory in every race we participate. That will also be the case in Portugal. “The course offers two sprint possibilities. 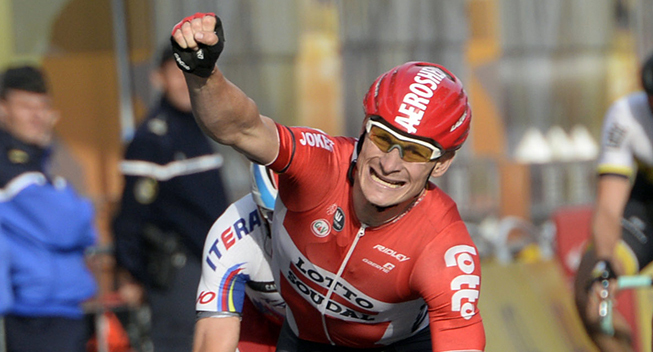 We’ll go for the victory with André Greipel or with Jens Debusschere in those stages. The other three days will determine the GC, which is not a main goal. We’ll wait how the race will evolve. If Tony Gallopin has a good position on GC we will defend that position of course. Tiesj Benoot, Stig Broeckx, Sean De Bie, Jens Debusschere, Tony Gallopin, André Greipel, Jürgen Roelandts and Jelle Wallays.